Definition at line 61 of file llviewerthrottle.h. Definition at line 200 of file llviewerthrottle.cpp. References BW_PRESET_1000, BW_PRESET_300, BW_PRESET_50, BW_PRESET_500, and mPresets. Definition at line 73 of file llviewerthrottle.h. Definition at line 72 of file llviewerthrottle.h. Referenced by idle_startup(), and LLViewerStats::updateFrameStats(). Definition at line 247 of file llviewerthrottle.cpp. References count, LLViewerThrottleGroup::getTotal(), llclamp(), MAX_BANDWIDTH, MIN_BANDWIDTH, mPresets, and S32. Referenced by resetDynamicThrottle(), and updateDynamicThrottle(). Definition at line 227 of file llviewerthrottle.cpp. References LLViewerThrottleGroup::dump(), LLControlGroup::getF32(), gSavedSettings, mCurrent, mMaxBandwidth, and resetDynamicThrottle(). Referenced by idle_startup(), and setMaxBandwidth(). Definition at line 294 of file llviewerthrottle.cpp. References f, getThrottleGroup(), MAX_FRACTIONAL, mCurrent, mCurrentBandwidth, mMaxBandwidth, and mThrottleFrac. Definition at line 235 of file llviewerthrottle.cpp. References gSavedSettings, mMaxBandwidth, and LLControlGroup::setF32(). Definition at line 241 of file llviewerthrottle.cpp. Referenced by process_agent_movement_complete(), and setMaxBandwidth(). Definition at line 213 of file llviewerthrottle.cpp. References gAgent, LLAgent::getRegion(), gSavedSettings, gViewerThrottle, load(), sendToSim(), and LLControlGroup::setF32(). Referenced by LLBPSListener::handleEvent(), LLBandwidthListener::handleEvent(), and idle_startup(). 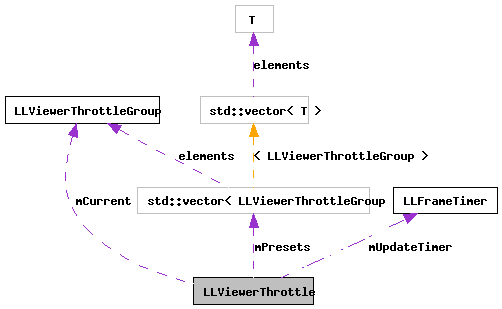 Definition at line 302 of file llviewerthrottle.cpp. References DYNAMIC_UPDATE_DURATION, EASE_THROTTLE_THRESHOLD, f, LLFrameTimer::getElapsedTimeF32(), LLStat::getMean(), getThrottleGroup(), gViewerStats, llendl, llinfos, llmax(), llmin(), MAX_BANDWIDTH, MAX_FRACTIONAL, mCurrent, mCurrentBandwidth, MIN_BANDWIDTH, MIN_FRACTIONAL, mMaxBandwidth, LLViewerStats::mPacketsLostPercentStat, mThrottleFrac, mUpdateTimer, LLFrameTimer::reset(), LLViewerThrottleGroup::sendToSim(), STEP_FRACTIONAL, and TIGHTEN_THROTTLE_THRESHOLD. Definition at line 85 of file llviewerthrottle.h. Referenced by load(), resetDynamicThrottle(), sendToSim(), and updateDynamicThrottle(). Definition at line 83 of file llviewerthrottle.h. Referenced by getCurrentBandwidth(), resetDynamicThrottle(), and updateDynamicThrottle(). Definition at line 82 of file llviewerthrottle.h. Referenced by getMaxBandwidth(), load(), resetDynamicThrottle(), save(), and updateDynamicThrottle(). Definition at line 87 of file llviewerthrottle.h. Referenced by getThrottleGroup(), and LLViewerThrottle(). Definition at line 90 of file llviewerthrottle.h. Definition at line 89 of file llviewerthrottle.h. Definition at line 80 of file llviewerthrottle.h.